Does Summer Work Turn Reading into a Chore? 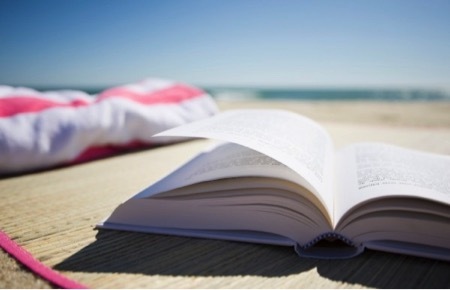 Summer reading on the beach is a perfect way to make it a bit more entertaining! Summer reading has always been a topic that people have a wide variety of opinions on. Each individual has had a different experience with summer reading, but generally summer reading begins in the lower grades and consists of a student reading a book or two that he or she enjoys, and then writing a summary of the book. Throughout the years as students progress through the grade levels, summer reading becomes more intricate, and ultimately turns reading into a chore. Reading becoming an inconvenience is one of several downsides to summer reading. Young children often have a love for reading, and have a great appreciation for it. Children’s love and appreciation for reading faltering is seen as young children become older and enter into middle school and high school. Summer reading, and reading in general, becomes something that must be done as a requirement for school, and students begin to dread picking up books to read. I personally feel that summer reading plays a role in the lack of pleasure reading I do in my personal time, and I feel this is similar for most high school students. Although there are people who still enjoy reading throughout the upper grade levels, I feel there has been a decline in general from the amount of people who enjoyed reading in lower grades. For example, when I was in elementary school, I can vividly remember my friends and I telling each other about the different books we read, our favorite authors, and recommending books to each other. Now as I am a sophomore in high school, I feel that one’s experience of talking about books with his or her peers sounds something more like complaining and groaning about the hundreds of pages of novels that they must complete for school. Furthermore, most students have several summer activities and have extremely busy summers. Most students have jobs, are camp counselors, or participate in something of a similar nature. Advocates of summer reading may argue that if students do not complete summer work, students’ skills will not be as sharp when they return to school and students will have difficulty readjusting to their study schedule. However, this is simply not true. Many colleges now offer summer programs to prospective students who are currently in high school, which span several weeks of the summer. These programs are becoming increasingly popular and many students attend these classes. Students may also be participating in summer classes with their school or at their community college to learn more about subjects that interest them. Students participating in programs similar to these will be keeping their brains active over the summer. For students whose schedules are packed with jobs or classes, summer reading can be an extra burden that students do not have time for. On the subject of colleges, summer is often the time when most students begin the college search and start to seriously consider schools by planning visits. A student, for example, may travel along the east coast over the summer to look at different schools, or may travel to different places in the country. Having to require summer reading adds stress to a student’s summer, and results in him or her having less time to visit and research potential colleges. On the other hand, people will argue that summer work is necessary to introduce students to the courses that they will be taking in the upcoming school year, and gives them a preview of what the courses they are taking will be like. For classes with heavier work loads, such as AP classes, teachers will likely argue that summer work is a necessity, due to the limited number of school days and the looming AP test date. This point is valid, and one must take into consideration the intense workload of AP classes. Specifically at IHA, most teachers will reward extra credit for summer reading assignments completed for his or her class, which is an incentive for most students. This is a positive aspect of summer reading, and I feel that this greatly motivates me over the summer to go above and beyond the bare minimum requirement. Although it may not seem like much, one or two points added to a student’s quarter average is extremely helpful in some cases, and can make a huge difference. Thus, the topic of summer reading will still be a much-debated topic in the future. Whether or not a student likes summer reading or dreads completing their summer reading, summer assignments will not be going away anytime soon.